Wooden pumpkins last from year to year, unlike that rotting vegetable on your front porch! 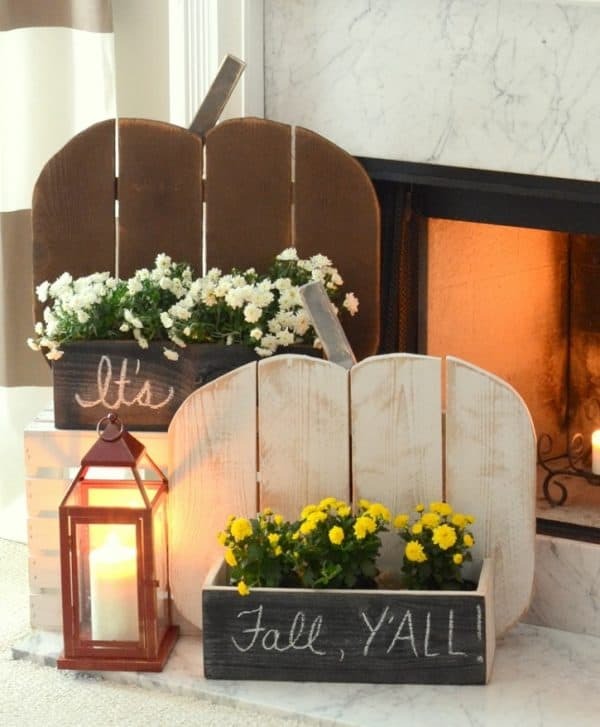 Turn your scrap wood pile into one of these wooden pumpkin ideas! 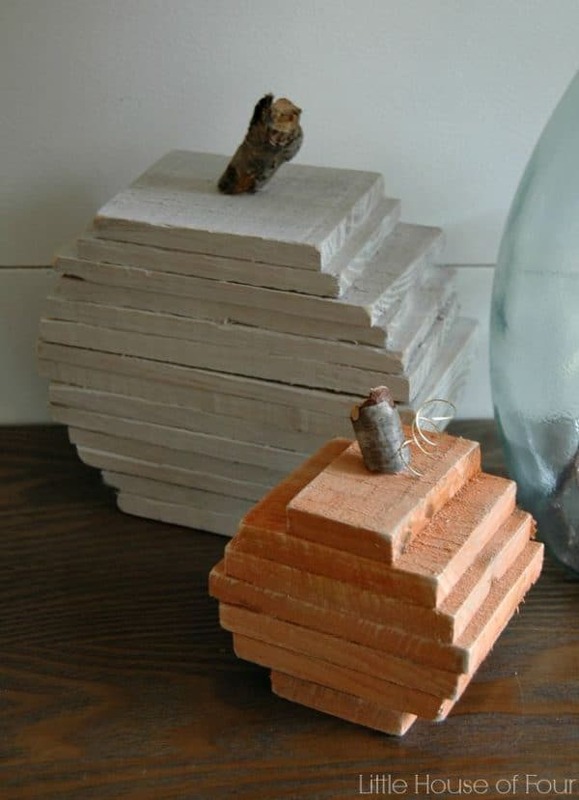 Seasonal decorations are the perfect way to use up that scrap wood pile! I’ve made giant conversation hearts for Valentine’s Day and oversized watermelon slices for summer out of 2 x 12 remnants. Fall is all about the pumpkins (PSL, anyone?) and most of these wooden pumpkins were created from free lumber. There are so many takes on the humble pumpkin, I’m not sure which one I like best! Ok, I lied. I know which one I like best . . . mine! 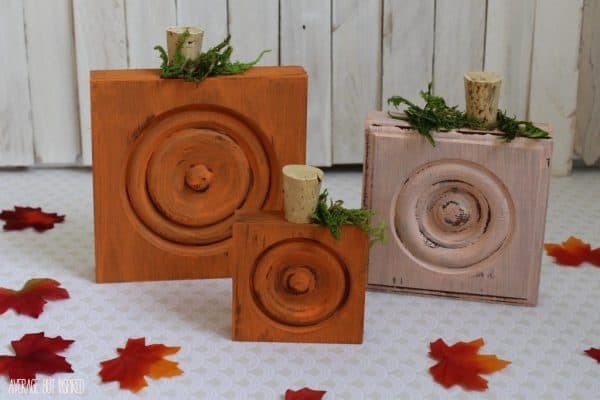 😉 This rustic pallet pumpkin trio was made with the wood from two pallets, along with a scrap piece of cedar for the base. 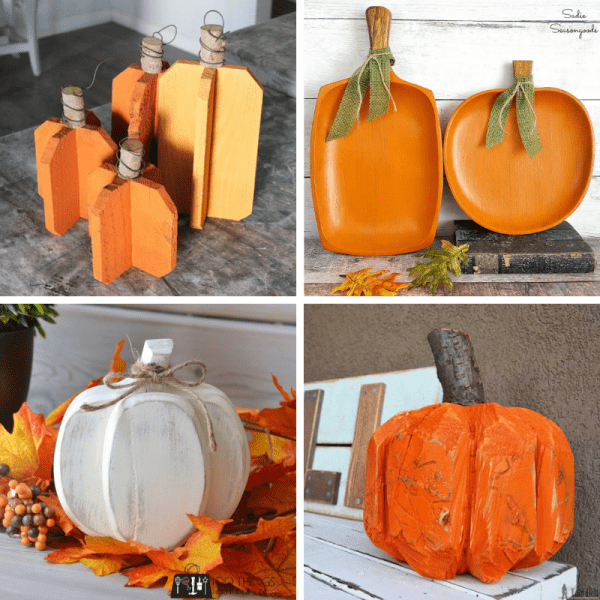 Wooden pumpkins can’t get much simpler than these! 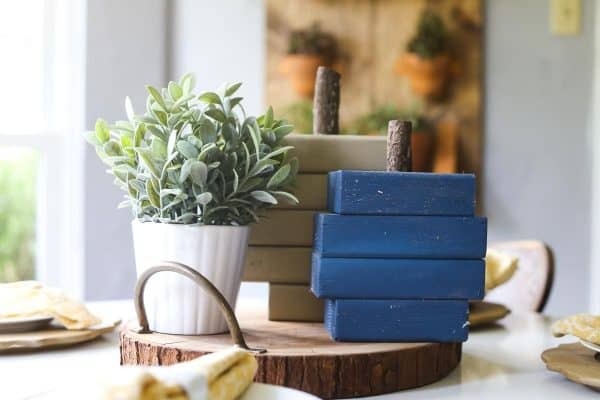 Just stack up some 2 x 4’s and add a stem to create these cuties from Love and Renovations. 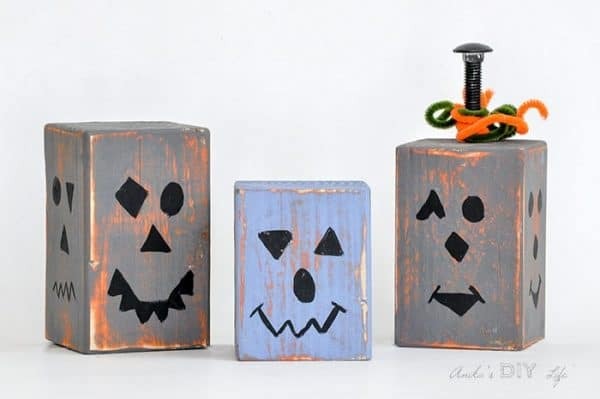 These friendly pumpkins from Anika’s DIY Life are made from scraps of 4 x 4. They’re so fun to stack and rearrange! 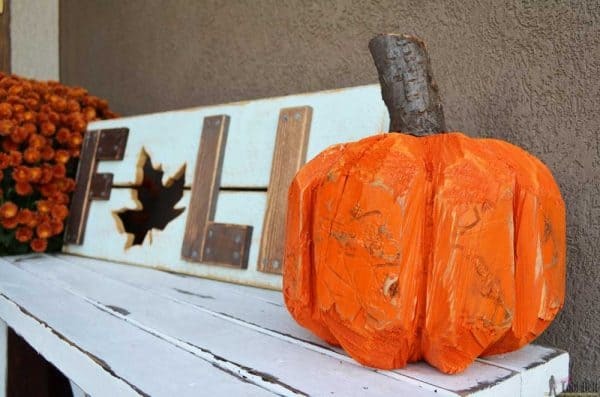 I love the X shape of these reclaimed wood pumpkins from The Summery Umbrella! The green wire around the stems gives the perfect finishing touch. 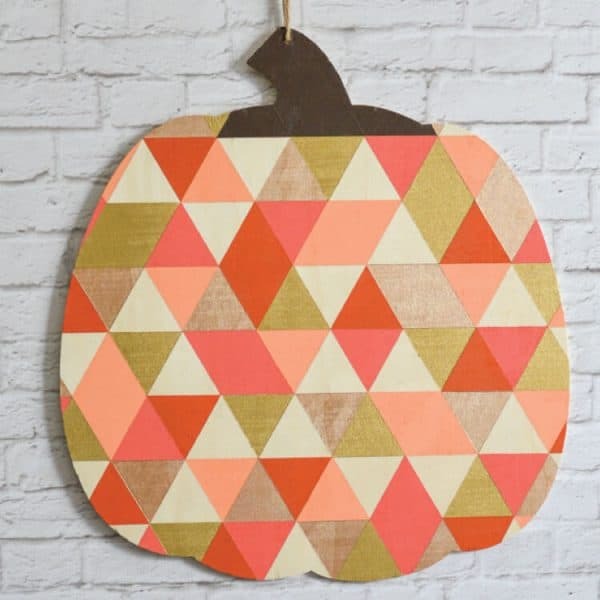 Go bold with this geometric pumpkin from Hey Let’s Make Stuff! You could change the colors to suit your decor while still giving your home a seasonal touch. Combine your wooden pumpkin with fall flowers like mums with this rustic pumpkin stand by The Frugal Homemaker! 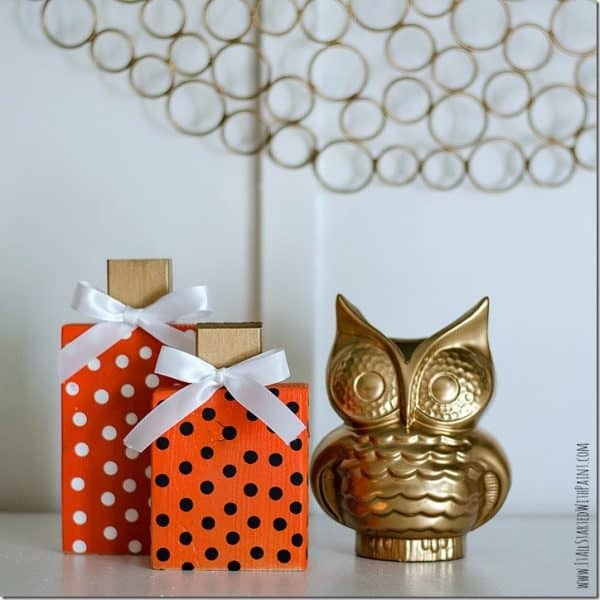 These polka dot pumpkins from It All Started With Paint are sooooo cute! The touch of gold on the stems brings the whole look together. 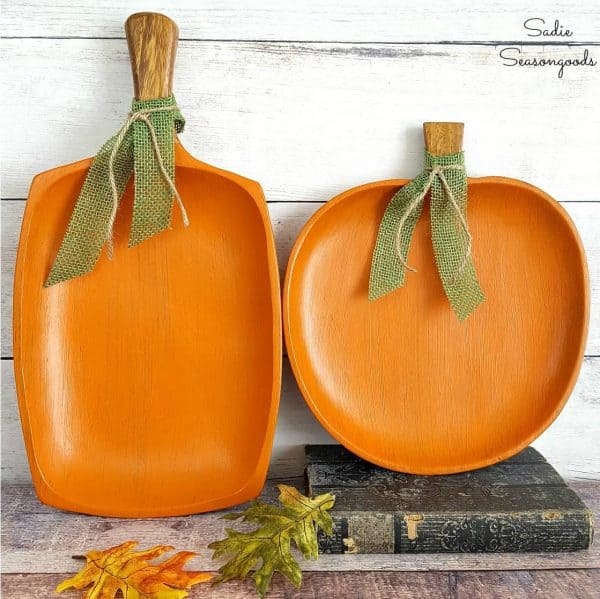 I’ve seen these wooden trays at the thrift store before, but I never thought to turn them into wooden pumpkins like Sadie Seasongoods did! Don’t toss that stump in the burn pile just yet! With a little creative carving and help from Her Tool Belt, you can turn it into a wooden pumpkin that looks just like the real thing! 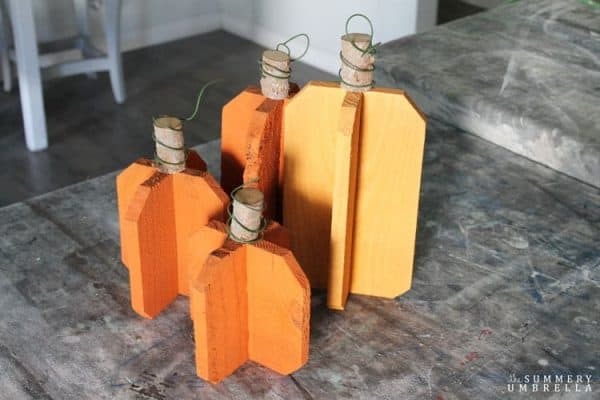 If you just have a few slats of a pallet left over from another project, slice them and stack them to form these little wooden pumpkins from Little House of Four. 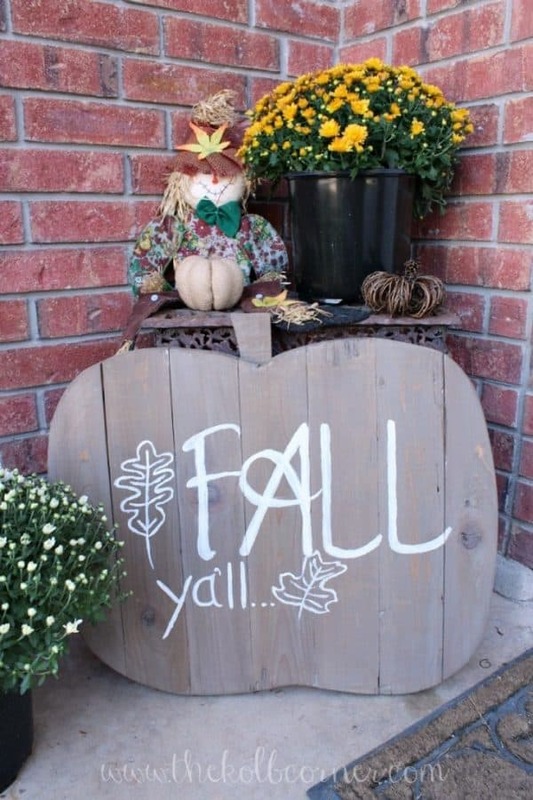 Nothing says you’re ready for fall quite like this wooden pumpkin sign from Domestically Creative! 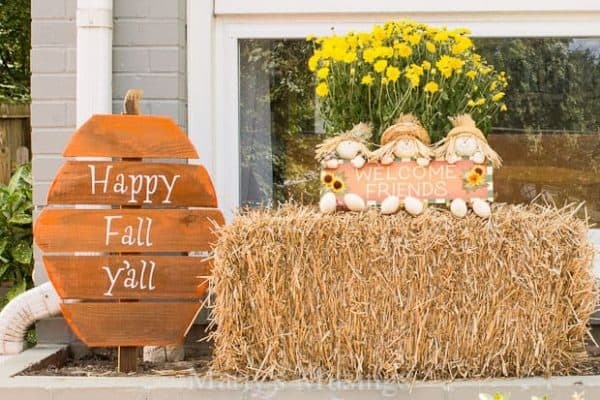 Turn those old fence boards into this cute pumpkin sign! This one forms a stake that can be inserted into the ground anywhere in the garden. 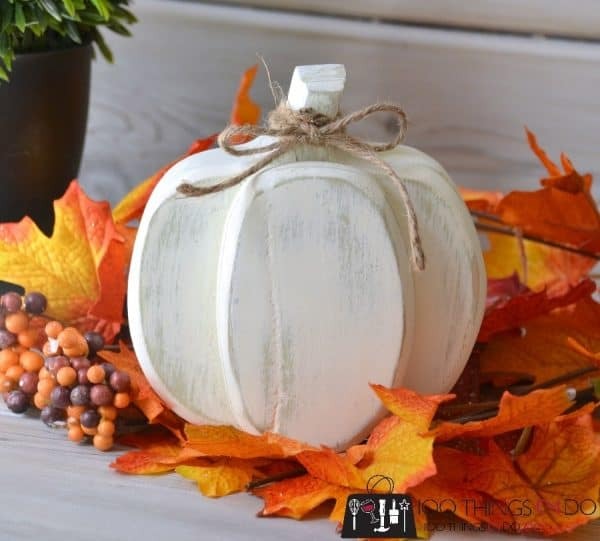 Take a stroll down the trim and mouldings aisle of your local home improvement store and pick up the supplies for these corner block wooden pumpkins by Average but Inspired! 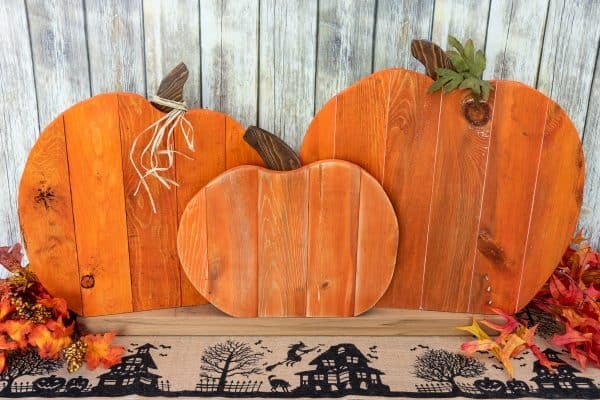 Adding an oval to the front of a flat wooden pumpkin gives it a three dimensional effect. This white one from 100 Things 2 Do would look great with any decor! 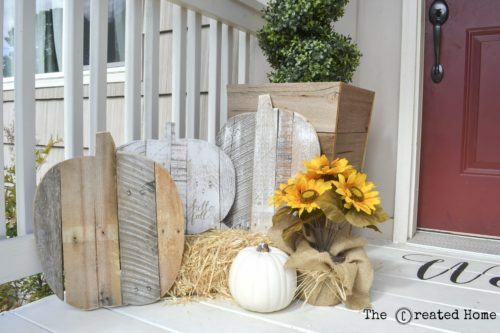 These pallet pumpkins by The Created Home are full of texture! You’ve gotta check out her aqua chevron version too! 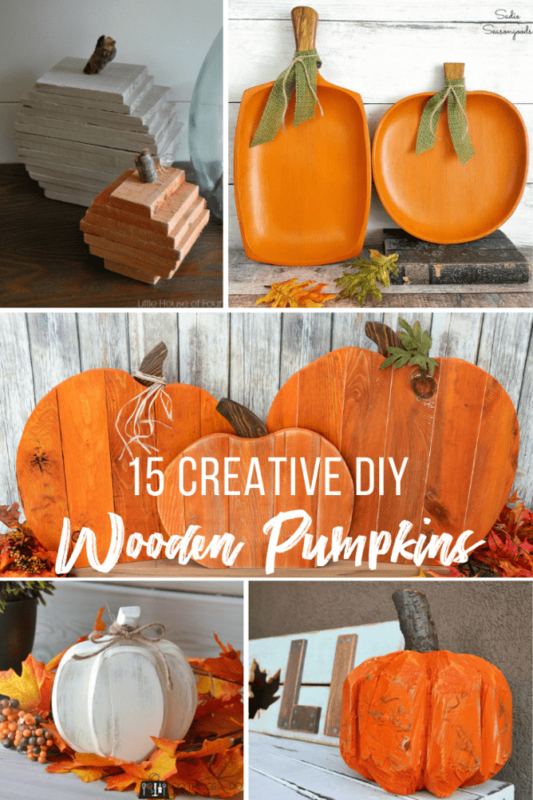 There are some great wooden pumpkin projects in this list! Which one is your favorite? I’d love to hear from you in the comments below! Super cute ideas! Pinned! Thank you for sharing on Merry Monday! Hope to see ya next week! Very cute ideas for different pumpkins! Love them all. So many options for this theme! And, they’re all fabulous. Thanks for sharing. Love these! Thanks for sharing at To Grandma’s House We Go DIY, Crafts, Recipes and More Wednesday Link Party. I pinned this! Hope to have you join again next week! So many fun ideas! I just turned a cutting board into a pumpkin. Thanks for sharing with SYC.